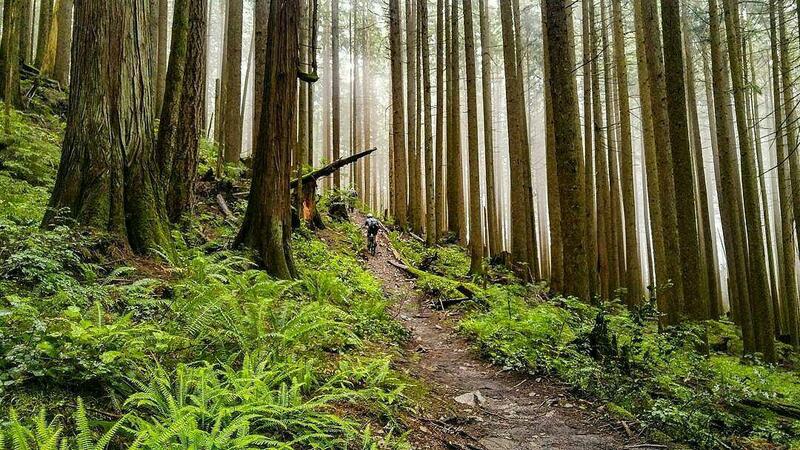 We are proud to announce today that we the North Shore Mountain Bike Association (NSMBA) have come to an agreement with the Canadian Mortgage and Housing Corporation (CMHC) and Recreation Sites and Trails BC (RSTBC) regarding the trails in the area known as the “Blair Rifle Range”. In late 2016, “No Trespassing” signs appeared suddenly on our most popular trails on Seymour. Thanks to an outpouring of community support – writing letters, emails and social media posts to share the value these trails hold for all of us – CMHC reversed that decision in the short-term, granting permission for recreational use of their land for us to enjoy again. * We have spent the past year working on a longer-term approach with both the federal and provincial governments to reach a trail maintenance agreement that also allows us to care for these trails and officially sanctions these trails. We also would like to acknowledge that the land on which the “Blair Rifle Range” sits is the unceded territory of the Coast Salish Peoples, including the territories of the xʷməθkwəy̓əm (Musqueam), Skwxwú7mesh (Squamish), Stó:lō and Səl̓ílwətaʔ/Selilwitulh (TsleilWaututh) Nations. We are excited to be authorized to maintain these trails as the local community resource they are. Regular trail maintenance ensures a good user experience and reduces risk caused by erosion and other trail hazards. Please join us at a trail day this year – there will be a lot of work to be done so stay tuned on our social media channels and monthly newsletter for these opportunities! As per the agreement signed, authorized trail maintenance is restricted to the rehabilitation, repair, and maintenance of existing trails. The Authorization does not permit construction of new trails or major re-routes of existing trails. The Authorization is granted for a period of two years ending on December 31, 2019. Enhance user safety- safety considerations must always be the first priority. Unsafe conditions must be corrected or normal use restricted. Protect the environment – environmental and trail damage should be corrected and actions taken to prevent further damage. Provide high quality, safe experiences for all approved users including mountain bikers, hikers, trail runners and others using recreation trails located on the Blair Rifle Range Lands. Canada Mortgage and Housing Corporation and the Province of BC look forward to working cooperatively with the North Shore Mountain Bike Association to assist in the maintenance and stewardship of the Blair Rifle Range Lands. The Province of British Columbia will be the point of contact on all matters arising under the Trail Maintenance Agreement by the Ministry of Forests, Lands and Natural Resource Operations and Rural Development – Recreation Sites and Trails BC branch. No funding has been provided at this time by RSTBC and CMHC to the NSMBA for work on the approximately 17 kilometres of listed trails but the NSMBA has been awarded a BC Gaming Grant of $16,500 to support the Trail Maintenance and Restoration on Seymour in 2018. Your support will be needed! Get your membership and trail pass to support the maintenance of the North Shore Trails and/or make a donation today! And once again, we wish to express our deepest gratitude for you, the community! This agreement was only made possible due to the tremendous support we have received and we look forward to making 2018 the best year for the North Shore trails we’ve ever had!